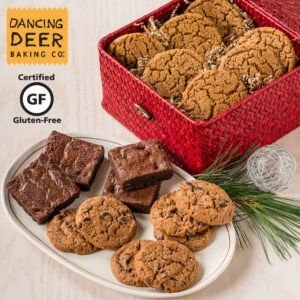 Dancing Deer Baking Co., a leading provider of gourmet food gifts and baked goods, has expanded its line of gluten-free treats. Recognized nationwide for their award-winning baked goods, Dancing Deer has taken several star-studded favorites and created gluten-free versions so customers with a gluten sensitivity or celiac disease can enjoy them. Dancing Deer’s bakers took the company’s best-selling items and tweaked the recipes to develop equally delicious gluten-free varieties. Their new gluten-free bakery goods include the soft Molasses Cookie—the first-ever cookie developed by Dancing Deer Bakery in 1994—as well as new gluten-free gift boxes. Many years ago, it was the mighty Molasses Cookie that helped put Dancing Deer Bakery on the map as this soft, chewy cookie with cinnamon and clove won the first of many food industry awards. Now, the scratch-baked Molasses cookie is also available gluten-free. The Gluten-Free Molasses Cookie is available in a number of gift sets or at retail in a 7-cookie pack for $6.99. Gluten-Free Chocolate Chip Cookies and Gluten-Free Chocolate Chunk Brownies are also available. Whether it’s a holiday party, birthday party, or an everyday occasion, Dancing Deer provides an easy way for people avoiding gluten to enjoy scratch-baked treats. The Dancing Deer Gluten-Free line is Certified Gluten-Free. All Dancing Deer treats are baked from scratch, certified kosher, and made in small batches with the finest and cleanest ingredients available. All bakery gift boxes are available for purchase at www.DancingDeer.com. Since 1994, Dancing Deer Baking Co., a leading national provider of award-winning, gourmet food gifts and baked goods for businesses and consumers alike, has been known for its delicious, scratch-baked brownies, cookies, cakes, baking mixes and gourmet gift arrangements. The company places an emphasis on giving back to the community, most notably by helping homeless and at-risk families through its Sweet Home Project initiative. Find Dancing Deer baked goods in specialty, natural food and grocery stores nationwide, on leading global airline carriers and on their website at www.DancingDeer.com.